Ok, so it’s 80 degrees outside on an October afternoon in Charlotte, NC. But fall IS on the way, and so I thought I’d cook something tonight that would trick me into thinking it really is cool outside. 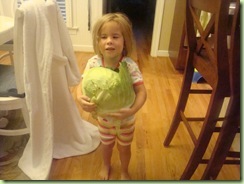 In this week’s box I received the largest head of cabbage I’ve ever seen. I think I’ll be slowly using that monstrous green globe all week long! Tonight, I’m pairing it with some of the Golden Delicious apples to make a cabbage-apple compote. I’m currently simmering some Bratwursts in beer with some onions and garlic. The brats will get finished off on the grill. As an aside, the Bratwursts are from What’s Your Beef in Waxhaw, NC. http://www.whatsyourbeefbutcher.com/ Vic makes some of the tastiest sausages around! I encourage everyone to support this local butcher! And to round out tonight’s meal, roasted Kennebec and sweet potatoes. 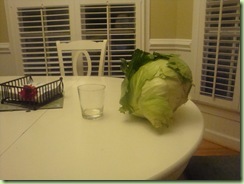 I have a picture of my monstrous cabbage that I’ll post soon, hopefully with some photos of this evening’s meal. we love that butcher! Jeff wants brats this weekend with the cabbage for football watching food.